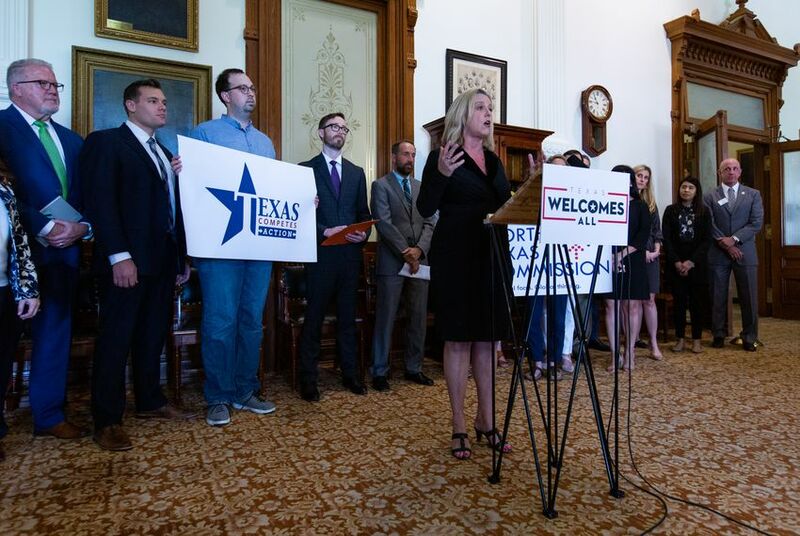 “The vast majority of business leaders in Texas know they have no greater ally than Lt. Gov. Patrick, who is helping lead the fight to ensure the Texas economy remains No. 1 in the nation and among the strongest in the world,” said Alejandro Garcia, a spokesman for Patrick. Not every major Texas business group attended Wednesday’s press conference or signed on to the letter opposing both measures. Several major groups backed the original version of Creighton’s Senate Bill 15, which was pitched as a consensus priority for the business community. “It is concerning and disappointing that businesses or anyone, for that matter, that would be against protecting one of our basic core principles of who we are as a nation,” he said. “The bill cannot impact a nondiscrimination ordinance, is only applicable to private employers, and promotes predictability for Texas job creators," Creighton said, citing an internal legal analysis by the city of San Antonio that indicated that the bill would not impact its regulation. That bill passed out of committee weeks ago and has languished on the Senate’s daily list of bills that are eligible for a vote. Perry’s Senate Bill 17 has not yet been placed on that same list. Business groups said they can’t risk the competitive disadvantage these bills would impose. At a hearing for Perry’s religious refusal bill this week, dozens of emotional witnesses told lawmakers how the measure threatened their comfort and safety. Fewer witnesses backed the bill. Perry said the bill has significant carve-outs for doctors and police officers, meaning it would not protect physicians or law enforcement who refuse to aid or protect LGBTQ Texans in situations when their lives are at stake. But witnesses, including a host of religious leaders, cautioned that that those limitations wouldn’t be sufficient to protect LGBTQ Texans from discrimination at the hands of occupational license holders like lawyers and social workers. Ash Hall, an LGBTQ activist, recounted an emotional story about seeking help from a counselor while struggling with depression at Baylor University. The counselor “seemed uncomfortable with me” but “put her religious reservations aside to listen,” Hall recalled. Disclosure: Amazon, Google, Facebook, Visit Fort Worth and Baylor University have been financial supporters of The Texas Tribune, a nonprofit, nonpartisan news organization that is funded in part by donations from members, foundations and corporate sponsors. Financial supporters play no role in the Tribune's journalism. Find a complete list of them here.